Are you looking for a good muzzleloader scope, but you are confused about which one to choose? With so many options in the market, I know that choosing the best muzzleloader scope can be challenging. Muzzleloaders are increasing in popularity and people are purchasing more scopes and other related accessories. There are solid reasons for that, shooting a muzzleloader is just something else, each shot is special and crafted by you. With the advancement of technologies muzzleloader rifles shooting range has increased a lot. Depending on the caliber some muzzleloaders are accurate up to 300 yards nowadays, something which was once impossible. For your rifle to be accurate to that range you will need a scope for it. It is important to consider various factors before choosing the most suitable scope for your muzzleloader. Most importantly, there is no point to go for magnification of more than 9x as this will be an overkill for a muzzleloader, no matter the caliber. It is also a good idea to buy a scope that is sturdy enough and can withstand anything your muzzleloader throws at it. After scouting through forums, reading through reviews and asking muzzleloader owners I have come up with the following list. Below are reviews of the 5 best muzzleloader scopes. You have to decide for yourself which one will fit your needs the best based on the specifications and the price. Nikon is considered as one of the best manufacturers of optical products. Their scopes have no match as they are high quality, very accurate and offered at affordable prices. The INLINE XR Muzzleloader scope is a prime example of that. This scope is designed specifically for inline muzzleloaders and therefore, it is an excellent choice if you own an inline muzzleloader. The lens quality of this scope is exceptional as it is 40mm and fully multicoated. The lens clarity is one of the best features of this scope and it will provide you with a clear view, no matter what the light conditions are, as long as it is not completely dark of course. The scope is also optimized for use with the Nikon’s Spot On Ballistic Match Technology, something a lot of you will appreciate. More about it here. No matter how far your muzzleloader can shoot with its 3-9x magnification, the Nikon INLINE XR has you covered. The magnification is easily adjustable with a power selector wheel, which is placed at a good distance so that you don’t move it accidentally. At all the magnification levels, the scope offers clear and crisp image. 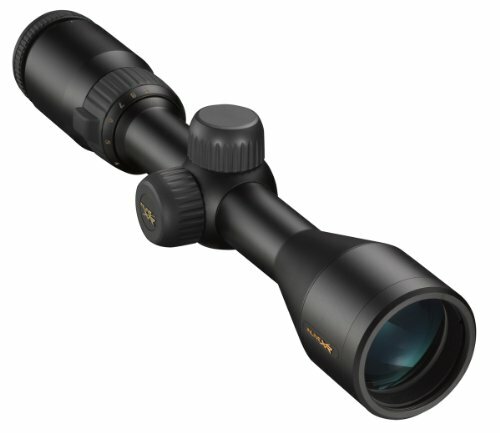 An excellent choice if you often change the distances you shoot on, or just like to have that extra magnification. The five-inch eye relief is a feature a lot of you will appreciate. I would say 5-inches is pretty generous eye relief and will keep your brow safe even with the heaviest cartridges. Always a nice feature to have no matter the type of the rifle you shoot with. 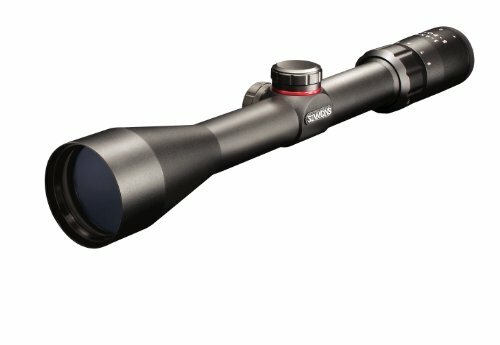 The Nikon INLINE XR riflescope is a unique scope that has a sturdy design and all-weather body. Used in this scope is the Nikon BDC 300 reticle which is muzzleloader specific and useful for shooting at different distances. The trajectory-compensating markers are present in the form of circles and won’t come in the line of sight. 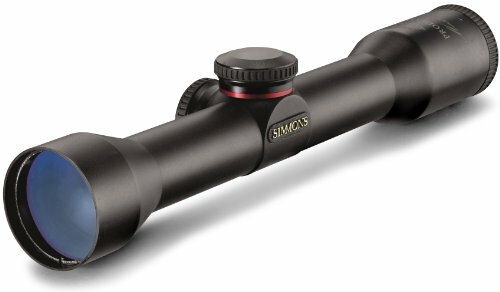 Simmons has a good reputation among rifle users because it manufactures powerful and durable scopes at affordable prices. Their scopes are loved in America and are ideal for multiple purposes. If you have a muzzleloader and usually shoot from the same distance, this scope will be a perfect one to make accurate shots. The Simmons is designed very well to make it easier for you to hold it. To provide a solid and secure grip, a rubberized surface is used so that it doesn’t slip when you’re using the adjustment knobs. The grip is known as SureGrip and is present in the zoom ring and the focusing ring as well. The windage and elevation are also adjustable, and the positive tactile click allows you to adjust precisely. The scope has fixed magnification and scopes with fixed magnification are usually better built than variable ones because there are less moving parts. The Simmons uses a HydroShield-coated lens that is ideal for use in humid and rainy weather and generally outdoors. The scope is basically fog-proof and it will provide you with a clear image in any weather. There is a recoil-proof feature too, so the scope can withstand almost anything. The Simmons also provides a generous 4-inch eye relief. The reticle of this scope is awesome and ideal for big game hunting. The scope uses a ProDiamond reticle, which does not distract the F.O.W. The crosshair is also very easy to view, even if the light conditions are not good enough. The Simmons ProHunter ProDiamond shotgun scope is an excellent choice for your muzzleloader if you are after a fixed scope. It is lightweight and provides a good view even when the season is rainy and humid. The scope is recoil-proof, fog proof, and waterproof making it one of the best muzzleloader scopes. This scope from Nikon is also an amazing one as it has one of the best set of optics and is available at a very affordable price for the quality it offers. The BDC reticle of the Nikon Buckmasters is unique as it has see-through circles that are perfect for long-range shooting. The reticle of this scope allows you to see clearly at ranges that were previously thought impossible. For short-range shootings, the reticle provides clear sights and the crosshair acts as an aiming point. The BDC reticle of this scope is just perfect as the circles don’t interfere with the image. The Nikon Buckmasters II has a fully multicoated lens that provides a bright and clear image in any weather. Even if there is low light, the lens will provide perfect light transmission and present a clear view of the target. The lens is made of multiple layers of various anti-reflective compounds which contribute to the excellent viewing quality The lens is fog proof, waterproof, and shockproof as well and is ideal for use in different climatic conditions. It can also withstand any amount of recoil your muzzleloader throws. Another important feature of this muzzleloader scope is that it uses Ballistic Match Technology which enables you to get accurate aiming spots. You can use the reticle of your scope to point to different yardages according to the load and ammunition. The Buckmasters II is a high-quality scope designed to hold its zero perfectly. It is very easy to handle and the optics are clear and crisp too. The scope is ideal to use in low light conditions as well. Overall, an excellent scope. It would also fit an m1a, read more about m1a scopes. Simmons Truplex Riflescope is a very versatile one and can be mounted on different types of rifles. The scope has a nitrogen-filled body and is available in a single tube design. The scope is waterproof and fog proof and is very durable, ideal for any weather. This muzzleloader scope can easily zoom within the range of 3x to 9x, so it allows you to aim comfortably and shoot at different distances. You can use the 3x magnification to aim at your target and zoom into 9x to get the best shots. At all the zoom levels, you will find clarity, resolution, and contrast and the good thing is that the zoom wheel also moves consistently and smoothly. The optics are fully coated and are anti-reflective and anti-glare too. The reticle of this muzzleloader scope is a Truplex one, which doesn’t have any range markers, but this makes it easier for you to aim at your target. According to a comparison between the Simmons Truplex Riflescope and other scopes with the same specifications, the light transmission range is around 90 to 93%, which means it can easily aim at objects as far as the full potential of a muzzleloader. The only drawback is that there are no illuminated reticles. The scope is not designed for very high-powered rifles or muzzleloaders as it can’t withstand their recoil. This scope offers a wide and clear field of view so that you easily can locate and aim at the target. Scopes that have a narrow field of view cause difficulty in aiming because the user can’t figure out the surroundings. The field of view of this scope is 31.4′ wide and has a 3x zoom, and with the 10.5′ field of view, you’ll get maximum magnification. Hence, even if your target is continuously moving, with this field of view, you won’t have the fear of losing it. 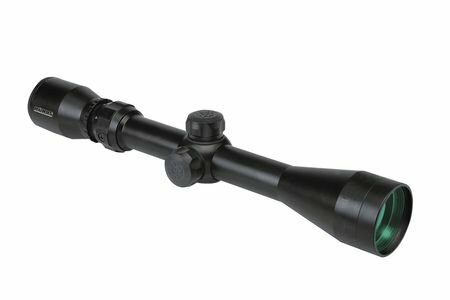 The Simmons Truplex Riflescope is very durable as it is made up of aircraft grade aluminum. It is also coated with a sturdy armor made up of rubber and thus, it is prone to bumps and drops. As mentioned earlier, it has a waterproof and fog proof design and is overall very durable. It would also fit great for a Ruger 10/22. The KonusPro muzzleloading riflescope can help you improve the accuracy of your rifle. It has lateral hash marks and if there are crosswinds, the reticle offers good compensation too. This scope is designed specifically for muzzleloaders. The KonusPro 275 has a multicoated lens which provides a clear and crisp view. Used in this scope is the engraved KonusPro 275 reticle. The reticle has reference lines and hash marks so that you can aim precisely at the target. The lens is fog proof and waterproof and thus, you can easily use it in all types of weather conditions. The muzzleloader scope has easy and smooth adjustments such as the finger adjustable turrets. The adjustment is of click type, and the turret height is medium. There is a fast focus eyepiece too to make focusing easier. The KonusPro 275 muzzleloader scope is one of the best muzzleloader scopes on the market, and its notable features are the exclusive ballistic reticle and high-quality optics. I hope my muzzleloader scope review will help all muzzleloader users in choosing a scope that meets their requirements. 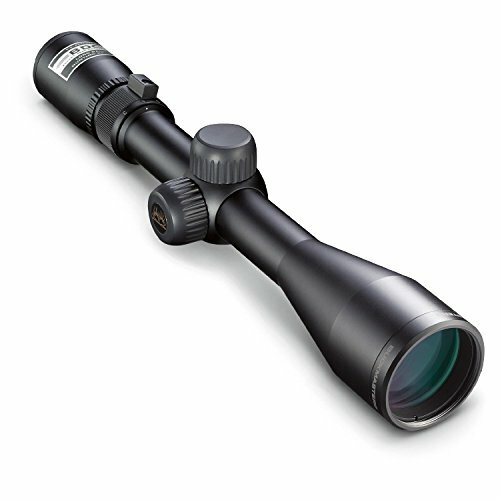 The review consists of top-notch scopes that are ideal for shooting on different ranges. The best muzzleloader scope, in my opinion, is the Nikon INLINE XR BDC 300.